NuffnangX on Monday revealed a new exciting plan for the newly created application on mobile. 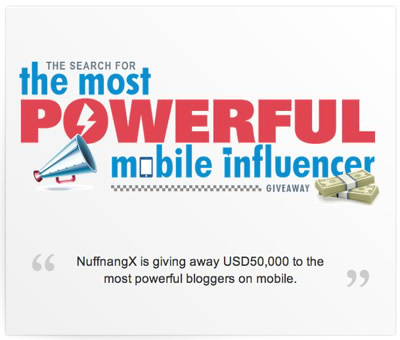 NuffnangX is in search now for the most powerful mobile influencer and will be giving away USD 50,000 to the selected bloggers. First Superblogger with 100,000 followers on NuffnangX will receceive USD10,000. First 50 x Alpha Bloggers , those who will have 10,000 followers on NuffnangX will receive USD500. And lastly, First 100 x Influential Bloggers to have 1,000 followers will receive USD 100. NuffnangX said that 50% of Facebook and Twitter users today access their social network on their mobile phones and as opposed to that, only 1% of blog readers in Asia come from the mobile phone. NuffnangX wants to help bloggers change that and make your blog as powerful on the mobile space as it is on the desktop. "So, if money is the reason for your blogging woes, worry no more! You can do whatever you want with the money-pack your bags and travel round the world. Buy that DSLR you've been dreaming about. Sky dive or climb Mount Kilimanjaro. Whatever you want, we'll give you the cash to do it. ", NuffnangX. Use all your social networks be it Facebook, Twitter and especially your own blog to build your NuffnangX followers. NuffnangX will automatically track your follower count and reward you the cash automatically at the end of this period. No submission is necessary. NuffnangX is a Social Blog Stalking mobile platform launched September 2012. It aims to revolutionize not just the blogging experience but enhance readership value. It is available for download in Google Play and iPhone App Store. Follow TheSummitExpress on NuffnangX now. Include us in your list of favorite blogs. Thank you.